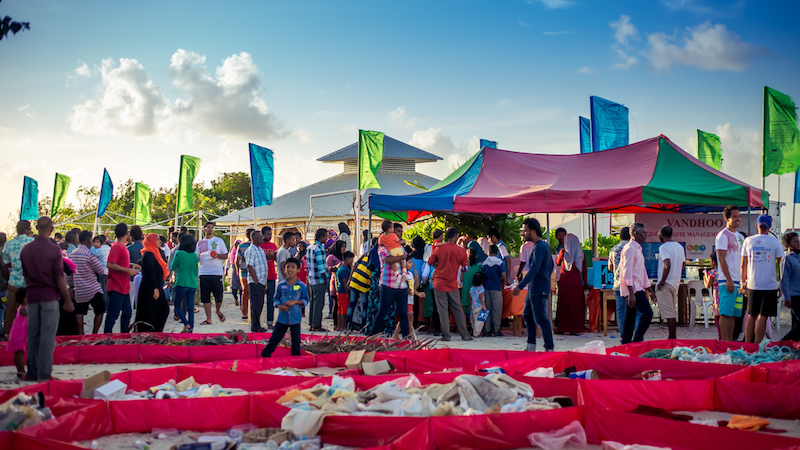 The Lhaviyani Turtle Fest took place this weekend on the island of Naifaru, bringing together groups from across the atoll to raise awareness about sea turtle conservation and waste management. Visitors and NGOs from the capital Malé joined local people for entertainment and educational activities, though the guests of honour had been on the island for some time when the bodu beru drums signalled the start of proceedings. As songs were sung, faces painted, seminars given and games played, the VIPs kept out of sight. The dozens of eggs, laid by green turtles on the beach weeks earlier stayed out of the limelight, fenced in for protection from poachers by marine biologists based on the island. The appearance of nests was as unusual as it was well-timed, providing the perfect backdrop as the rest of the community gathered to learn how to protect their endangered neighbours. “It was a great opportunity to further raise awareness about the issues of egg poaching,” said Fanny Vessaz of Naifaru’s Atoll Marine Centre. Five of the world’s seven turtle species are found within the archipelago, all of which have been placed on the IUCN’s red list for endangered species. Sighting the sleepy strokes of a hawksbill or an olive ridley is the highlight of many a visitors’ trip, and the benefits of keeping the local population healthy is now a question of economics as well as ecology. The eating of turtle eggs has been a part of Maldivian culture for centuries, though the consumption of turtle meat became widespread only after the removal on religious prohibitions in the late 1940s. Growing local consumption coupled with the rise in demand for tourist souvenirs in the 1970s put greater pressure on the turtle population. But the waves of global tourism soon brought the conservation movement to the Maldives, with restrictions on the killing of turtles beginning in 1978. A 1995 moratorium on the catching and killing of turtle products was made permanent this year, while a ban on egg collection in specific islands has just been expanded to the whole country. 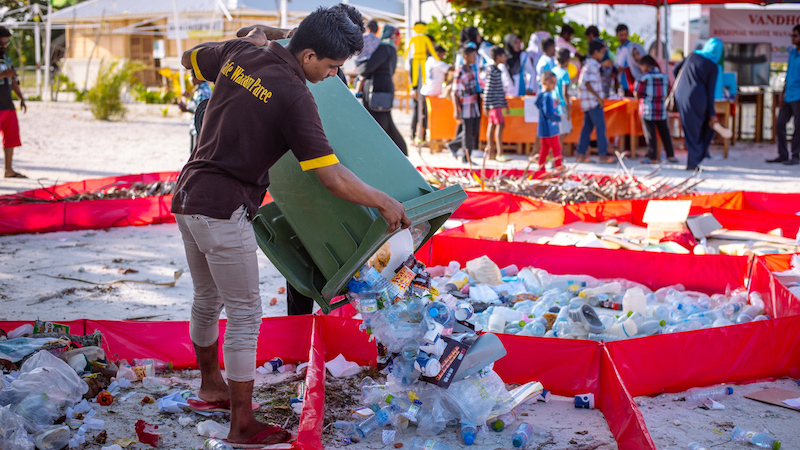 Rather than relying on legislation, however, the events organisers hope to spread the message that awareness-raising alongside waste management is key to protecting the species. Presentations given during the event highlighted the damage caused to local turtle populations by marine litter, with plastic bags often mistaken for jellyfish and eaten. 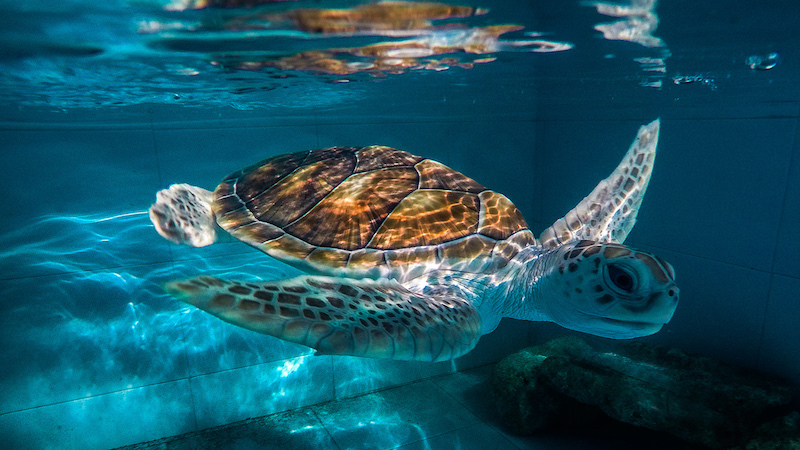 The frequent discovery of young turtles stranded in ‘ghost nets’ was also discussed. Not used by Maldivian fishermen, the nets can drift thousands of miles before injuring and killing turtles in Maldivian waters, and should be collected whenever found. 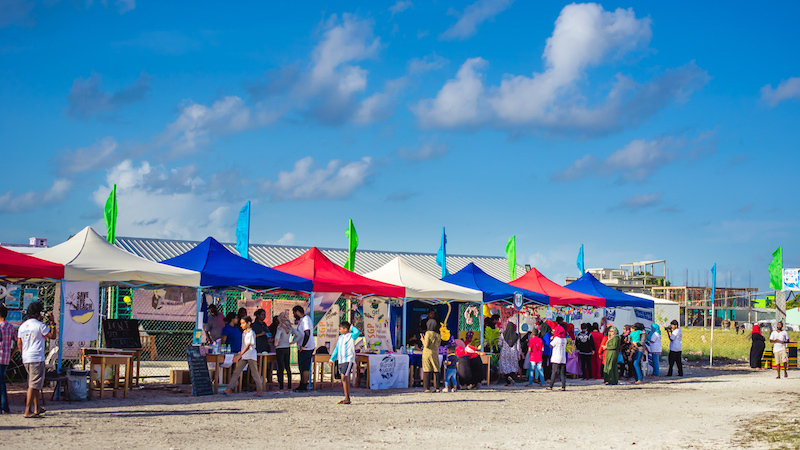 The festival – the first of its kind in the atoll – saw participation from organisations such as the Environmental Protection Agency, the UNDP, the IUCN, conservation groups, and local schools and colleges. 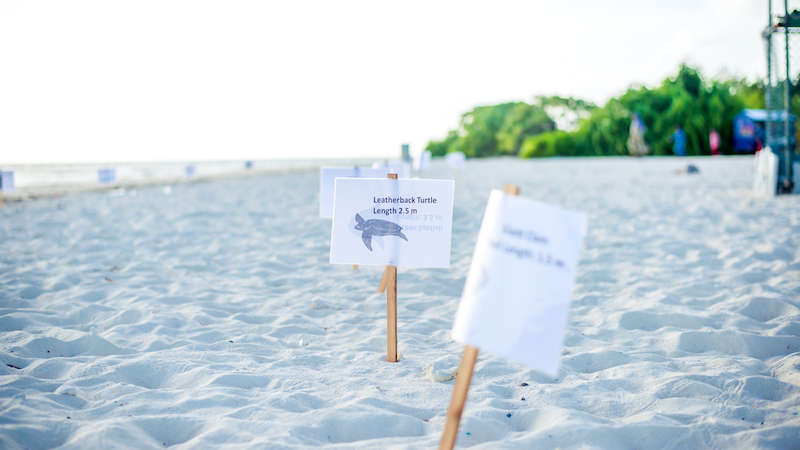 Nearby resorts – which have become some of the main players in local turtle conservation – were also present, with staff from Amilla Fushi, Four Seasons and Kuredu all helping to spread the message. Just opposite the colourful stalls lay a 20 foot turtle diagram, its frame filled in with locally collected waste to demonstrate the importance of better refuse management. The fishing nets in the head will take 40 years to break down, explained a handout being distributed nearby. 450 years will be needed to break down the plastic bottles in the flipper, and 20 years for the plastic bags in the stomach. The beneficiaries of the enhanced awareness sloshed around in the tanks of the marine centre behind the festival. Unwanted pets nursed to full strength, these young turtles are being hand-reared until they are a year old, after which they will spend a few weeks in an open water cage preparing for their eventual release. The natural survival rate of these juvenile turtles is 1 in 100, and that of those still protected in the nest 1 in 1000. Everyone from the Lhaviyani Turtle Fest 2016 will try to ensure that human activities don’t further narrow these odds. Everyone inside the eggs will appreciate the support.